I will preface this post by saying I've known Tony for several years and consider him a good friend, however this was business - totally different thing. I was treated no different than any other customer would be (so don't read this review thinking he pulled some strings for me). I noted a few posts recently on the TFF about Moritz cutting deals and earning more business, especially in June, so I called Tony out of the blue Saturday to see what he had in the line of a new Suburban LT. Sure enough, some choices were sent my way in short order - literally while we were on the phone (I'm in Houston btw) - all fitting within my parameters on color, options, price, etc. I asked him to get me a quote on my trade-in and while he did that, I called the dealer that sold me my wife's new Tahoe last fall for a similar quote within my parameters. I told the other dealer to make a first and final offer to keep my business in Houston - he knows me and my credit score and knew I was ready to buy. Tony came right back - great price / fair trade-in allowance / no drama. I told him I would get right back to him. My local dealer came back at me with a similar deal that would have been about $1000 more than Moritz. I told them "no thanks" and they asked me to come in so we could talk about it. Going in to "talk about it" took 4 hours when I bought my wife's vehicle, and I don't have time to talk over what effectively was simply the price with different levels of a dealership's management. Tony and I agreed to a deal. I asked when I should drive to Dallas to complete everything. He informed me that delivery to my home in Houston was included, and the driver would be at my house Sunday (Sunday???) if that was convenient for me. Sure enough, my new Suburban arrived on time Sunday and the driver had all the paperwork in-hand. A couple of signatures later and he was on his way back to Dallas with my old truck and I had my new one. No drama, no errors, no extra charges for things previous dealers have tried to sneak by me. Everything was 100% as Tony said it would be. 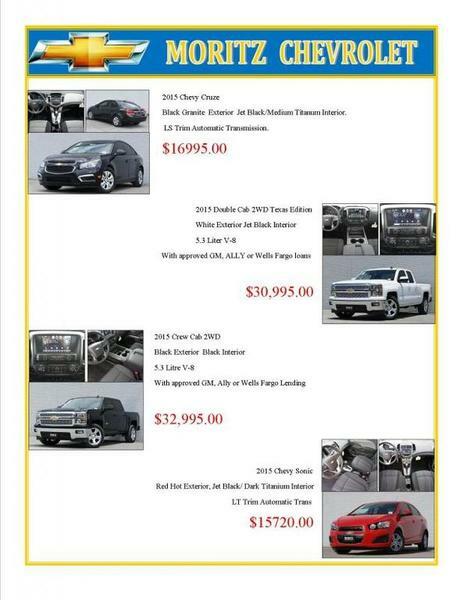 So, if you're looking for a new Chevrolet right now, give Tony a call at Moritz. He's easy to find and easier to deal with. Drop me a PM if you have any other specific questions about my experience and I'll be glad to answer. Awesome review thank you for sharing your experience we take Pride in taking care of our TFF friends!! They both are a cut above the rest. They have earned my business twice. Looks like I know where I'm getting my next truck if it's a Chevy. That's A+ service for sure. I have not purchased from Tony, but have from Monte, and can tell you the service was top notch. Between the wife and I and our 3 kids we have bought 6 total vehicles from Moritz. 5 being in the last 18 months. All were great experiences. Thank you to everyone who has allowed Me and my team the opportunity to earn there business. We have another day or 2 to close a huge objective for GM. If we can help you fulfill any automotive need, please get with me so we can make you part of the Moritz Chevrolet family. Damn. I've never heard anything like that. That's unreal service. I'll post up if we make a deal. There are no better guys in this business than Monte and Tony. They've earned my business for life because of similar experiences I've had with them. Who give the better deal Monte or Tony ?